Each level is a single screen, with a path that the balloons travel on. If too many balloons make it to the end of the path, you lose points, and if you lose all of your points, you must start the level over again. 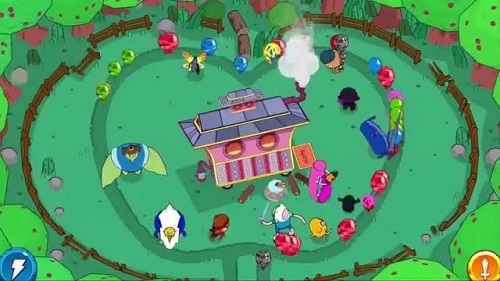 You must place Adventure Time characters like Finn, Jake, Bubblegum Princess, Ice King, and many more strategically on the path so they can pop the balloons as they go past. Each character has his or her own range and skills. For instance, Finn uses a sword and can attack quickly, and Bubblegum Princess has a bubblegum gun that can slow down the balloons as they go by. Balloon come in different colors and patterns, and can have higher defense, go at different speeds, and even can be camouflaged. The balloons come in waves, and as you pop them, you’ll earn coins. Use the coins to upgrade your characters’ range, attack power, speed, and more. Whenever you have enough coins to upgrade a character (using the touch screen), you should do it right away. That’s the main trick to beating the levels. After you complete all the waves, you’ll earn treasure and other goodies. Use these spoils to equip permanent upgrades to characters in the menu screens. As far as presentation value is concerned, this game is just oozing with quality. Every character is fully voiced by the cast of the show, and even guest characters like the Bloons Monkey has spoken dialogue. I had a few problems with the game, though. The map screen is a little confusing, using the menus between levels is a bit fiddly, and the game just didn’t have a whole lot of interactivity. You mostly just watched them pop balloons until you needed to tap to upgrade them. But then, I’m not the biggest tower defense fan either. But if you love Adventure Time and tower defense games, then it certainly wouldn’t hurt to check out this freebie. You just pop balloons, and that’s as violent as it gets. If you’re OK with your kids watching the cartoon, they’ll be OK with this game. Reading skill is helpful for some of the menus, and parental supervision is recommended for the in-game purchases and ads.